Patellofemoral pain (pain around, behind or under the knee cap) is very common, and affects both males and females of all activity levels. It often results in pain during simple daily activities such as walking, running, sitting, squatting and walking up stairs and down stairs. What Might Cause my knee pain? 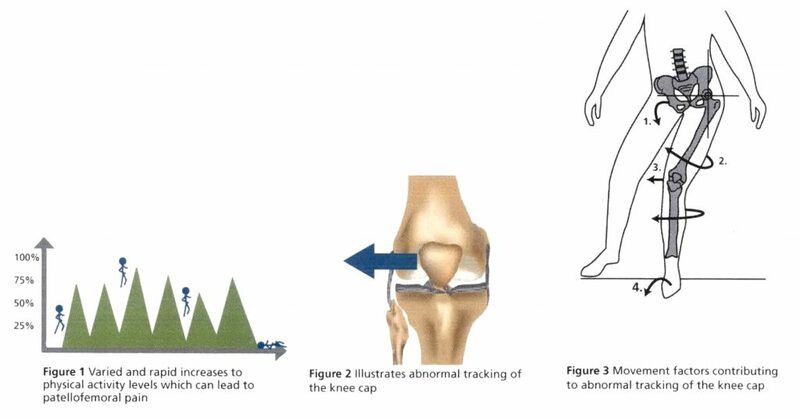 Excessive loading or varied and rapid increases to physical activity which your knee cannot cope with (Figure 1) are thought to contribute, with the knee cap thought to move toward the outside of the knee (Figure 2), stoping it from tracking normally in its grove. A number of factors can leat to this poor tracking (Figure 3). There are numerous other contributing factors to patellofemoral pain including the structure of your knee, trauma, surgery and systemic disease, which you may wish to speak to your therapist about. Pelvis drops on opposite side, placing increased tension on the outside of the leg and pulling the knee cap outward. Hip collapses inward and rolls under the knee cap due to poor function and weakness of the hip muscles. Thigh muscles are weak or function poorly. meaning there is inadequate support for the knee and knee cap. Foot rolls in too much, causing the shin and knee to collapse inward under the knee cap. WHAT EXERCISE PRINCIPLES ARE IMPORTANT? Your therapist may suggest a period of rest before starting exercise again. Exercises in sitting or lying at the beginning may help to get your hip an thigh muscles functioning without pain. As soon as pain allows, exercises should be performed in standing postures which mimic everyday activities. Your therapist should supervise you with any new exercises to ensure correct techniques at home. Using mirrors and video recordings may help you to complete correct exercise techniques at home. WHAT EXERCISES SHOULD I BE COMPLETING? 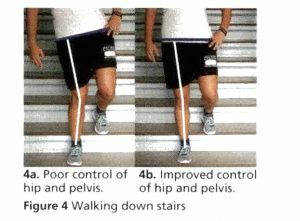 Weakness and poor function of the hip and though is common so you will most likely need exercises to improve this. Sometimes exercises for the foot or back are also required. You may need to stretch your calf, hamstring or thighs. Exercises should be progressed to activities you previously had pain with (squatting, stairs, running, etc.) ensuring good movement patterns during their completion (Figure 4 – example). Taping or strapping can relieve pain in the short term – your therapist can apply this or team you how to do this. Braces can also help relieve pain. Foot orthotics sometimes reduce pain – your therapist will help you decide if they are appropriate, or refer you to someone who can. HOW ELSE CAN MT THERAPIST HELP? Guide yo on you most appropriate exercises and other helpful treatments. Answer questions related to your knee pain, and explain in greater detail the contents of this information where necessary. Help you understand why you have knee pain, what factors have most likely caused your pain and how to modify you activity to improve your pain and recovery. Provide manual therapy which may be important to improve pain and flexibility. Poor function and weakness of hip muscles. 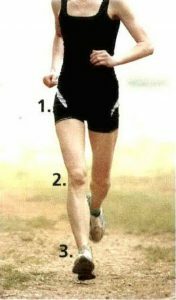 Poor function and weakness of thigh muscles. Too much foot roll (pronation). Exercise to improve strength and function of the hip and thigh muscles. Taping of the knee cap to reduce pain in the short term. Foot orthotics if you have too much foot roll (pronation). If you think you have patellofemoral pain, you should seek help as early as possible – this will improve your chances of a successful recovery. There are many effective treatment options which you should discuss with your treating therapist. Your recovery will be best if you actively participate in your rehabilitation. Appropriately modifying your physical activity level is often the first step towards successful recovery. 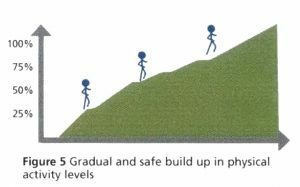 Ensure you slowly and safely build up your physical activity levels (Figure 5). This information has been created as part of a not for profit endeavour by Dr. Christian Barton and Michael Rathleff. Further information related to managing patellofemoral pain can be found on the Petellofemoral Blog at Complete Sports Care.